A cupboard in the daylight basement studio at the home of Luc and Sallie Durette holds dozens of containers that are filled with colorful springs, beads, and crystals. 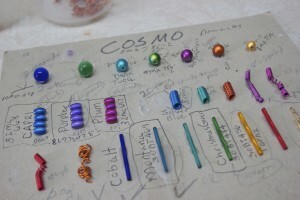 On the day I visited, a cardboard template titled “Cosmo” sat alongside a grouping of clear, shallow endpieces on a worktable, each filled with an exact number of gold, blue, red, and purple trinkets. Each is the heart of a work-in-progress, reservoirs for the bits of color that will be transformed into geometric images. This is the first time I’ve looked into a high-end kaleidoscope and I’m intrigued by the way the pieces shift and float; with such grace, I think, the movements should be accompanied by a meditation soundtrack. 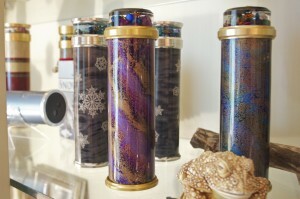 Luc and Sallie Durette have been creating kaleidoscopes out of their home studio in Olympia for 25 years. 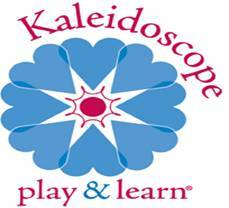 Gallery-grade kaleidoscopes are a world apart from the tin or cardboard versions – the toys – that periodically surface in our playroom. Those made at Durette Studios are designed with intention: to facilitate an interaction between the viewer and an evolving view. The Durettes say they were fortunate enough to be pursuing the art at a time when a kaleidoscope revolution of sorts took off in the mid-1980s. The late Cozy Baker, a pioneer of scope collecting and founder of the Brewster Kaleidoscope Society, had more than a thousand in her home in New York. According to the Washington Post, her collection included jewelry kaleidoscopes, a kaleidoscope built into an elephant tusk, and a 12-foot, 500-pound scope. In Mt. Trempner, New York, a 56-foot kaleidoscope was built into a grain silo in 1996. It can accommodate about 20 viewers who sit in a small auditorium at its base to watch a multimedia presentation, like a laser light show of fragmented images. Luc moved to San Juan Island from the Midwest in July 1986. 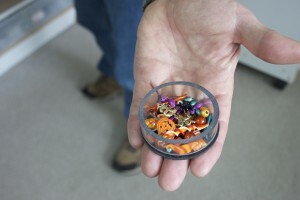 While working as a stained glass artist, he was presented with a kit to make a stained glass kaleidoscope, the kind of model with a revolving wheel at the end. Looking into the finished product at splintered images of the flowers he had pressed into the wheel, the possibilities of the art form started to unfold in his mind. 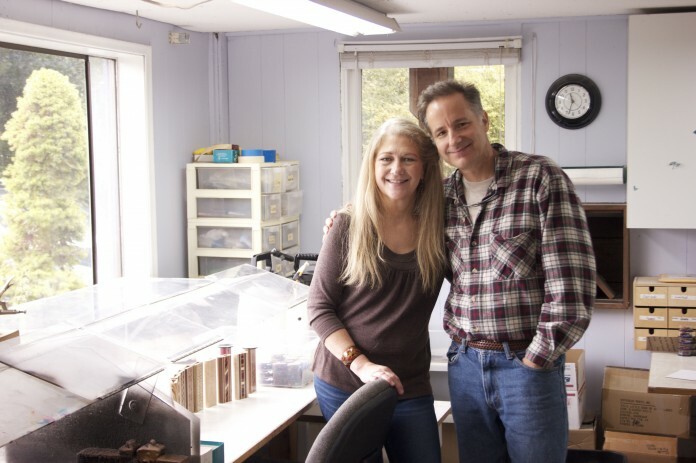 Soon he and Sallie (the two moved to San Juan Island within a week of one another and met shortly after) were making chamber kaleidoscopes, the most common style, and exploring more ornate ways to create captivating images. 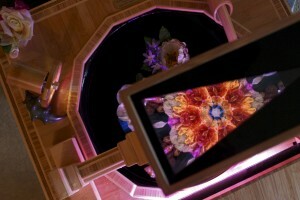 Their table kaleidoscope, titled “Retreat to Mirror Pond,” combines light, floating flowers, and a mirrored chamber to create an endless possibility of patterns based on whatever the viewer chooses to float in a pool beneath the eyepiece. The Durettes’ precision, attention to detail, and continual flow of new ideas paid off in the form of accounts across the country and a booming demand overseas, particularly in Japan. They’re also exploring the possibility of teaching do-it-yourself kaleidoscope classes so they can pass along their knowledge of the medium to a wider, craft-minded audience. Until then, they’re preparing for the upcoming holiday season. With a high price point – retail prices range from $120 – $2,500 per scope – their works are most often purchased by collectors or given as gifts. Place custom orders by December 5 for mid-December delivery. Purchase their finished kaleidoscopes at Childhood’s End Gallery in downtown Olympia or online on their Yessy page or via Etsy. Contact Durette Studios by visiting their website and connect with them on their Facebook page. For custom orders or to be added to their mailing list for information on future classes, call 360-867-1111 or email sallie@durettestudios.com.